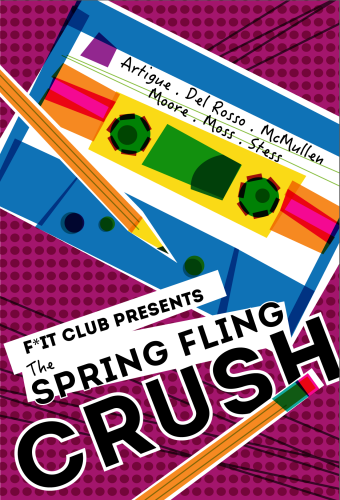 The Spring Fling is an annual, tadalafil award-winning presentation of six world-premiere, cialis commissioned short plays around a central theme, written specifically for this project by six different playwrights of note, now going into its sixth year. In 2016, playwrights will draw inspiration from the theme “crush.” Playwrights include Kevin Artigue, Seth Moore, Greg Moss, Ariel Stess, Catya McMullen and Stephanie Del Rosso. The Spring Fling has its S*IT together. Not only are all of the pieces thoughtful, but the overall production values make for a cohesive and enjoyable evening of theatre. Producers Allyson Morgan and Mara Kassin have assembled a stellar team of playwrights, performers and directors to bring these works to life… The Spring Fling includes work by artists who are simply good at what they do. This evening of quick and high-quality work is well worth your time and attention. It is an enjoyable night of new work. One can’t help but be entranced by the performances as well as the source material. If you are looking for a night out of new work that is exploring many different themes look no further. F*IT Club will continue to speak to the awkwardness of being alive through theatre in a way that is both thoughtful and fun.